Container Gardening is a wonderful starting point for many new gardeners, a way to create “special gardens” for others, or even a great place to plant edibles in containers right on your patio. Many of us with established gardens are finding that containers are a great way to introduce a beautifully planted architectural feature in the garden. There are so many containers available it’s hard to contain yourself! Glazed, cast iron, wrought iron, terracotta, concrete, wood, tin, composite/faux, plastic so many materials to consider. There is one simple thing to remember about choosing a container—drainage is necessary in all containers. Too much water building up in the container after rain can quickly drown the plants. A single hole proportionate to the size of the pot is all that is necessary. Remember as we plant those big containers and urns that their drainage holes may have to be cleared annually. Good drainage is key to successful container gardens. Terracotta, wood, and some ceramic containers should be brought in from the cold every year. The temperature ups and downs wear on the materials until they crack and splinter. Terracotta containers are often unglazed, but some are glazed. Most terracotta are not Chicagoland winter worthy. Concrete and cast iron containers are often the heaviest and largest of containers. Concrete and cast iron can be left out year round. High-fired glazed containers will take some prep for a winter outside. They should only be half full of soil/material that will allow water to drain through. Elevate them using pot feet or bricks so they are not sitting directly on the ground to allow water to drain. Over the years cast iron will patina and turn rusty. A good wire brush and several cans of high quality spray paint will freshen it up. Composite/faux and plastic containers are lightweight, portable and often look just like the real thing. Plastic often cracks with the freeze/thaw in the winter, so luckily it’s very lightweight and easy to move into the garage or basement. Many of the composite/faux materials weather our winters just as well as concrete and glazed containers. There are containers for everyone you just need to choose the ones that fit your style. Have a sunny spot or a shade filled yard? There are so many annuals, perennials, natives, succulents, sedums that no matter the container there are plants that will work at your site. Pick out your favorite site-appropriate plants and follow the simple “thriller”, “filler” and “spiller” formula. Thrillers are the focal point of your container. It can be a showy flowering plant, a tall plant or even a fun garden accent piece. 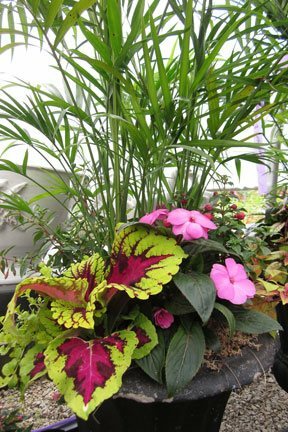 Fillers are mid-height plants that add volume to your container. They complement the thriller color and contrast with its texture. Spillers are plants that cascade over the edge of the pot, soften the edges and help to unify the design by use of color or texture. It’s also important to use a nice lightweight potting soil in your containers. We recommend using our Growing Place Choice Potting Mix. It’s the same mix we grow all our plants in. There are so many edibles that do well in a container. Tomatoes (determinant varieties that grow to a set height), pole beans, peas, pea pods can be supported by a topiary. Bush zucchini, peppers, garlic, onions, most herbs all do very well in containers in the sun. Just imagine the convenience of having herbs at the ready in a container outside the kitchen door when cooking. Lettuce, kale, and Swiss chard are cool weather plants, perfect in a container spring into early summer and then late summer into fall. How about working with the children in your life this summer and plant a spaghetti garden. In one larger container, plant a Roma tomato and then plant your herbs—oregano, parsley and basil—together in another. Or how about a salsa garden with peppers, as hot as you can handle, tomatoes and cilantro creating a nice cluster of three containers. The kids can plant, water, weed, feed and learn how to grow a garden on a smaller scale that will lead to success. Miniature gardens are really the most fun as they let your imagination soar. A low broad container, a wooden box, an over-sized coffee cup or an old roasting pan are just some simple ideas for containers perfect for building a mini garden. The miniature plants, tables, chairs, fences, trees, trellises, bridges, chandeliers are all available for you to build the fairy mini-garden of your dreams. Children and adults alike enjoy mini gardens in all sizes. Plant a container that will support nature and urge the birds, butterflies and beneficial insects to visit you. Parsley is one of the favorite meals of many caterpillars. Consider using parsley as a filler in your butterfly container. Salvia, Dahlias, Angelonia, Pentas, Lantana, Zinnia, Alyssum, and Calibrachoa are all wonderful annual plants to attract butterflies and hummingbirds. Perennials like Rudbeckia, Buddleia, Delphinium, Digitalis and Gaillardia are a few of the great loves of butterflies and hummingbirds. Containers can be set up in a grouping of one color in a garden to draw ones eye. A large container of red Begonias springing over the very top of that container adds a color pop in a shady green garden. 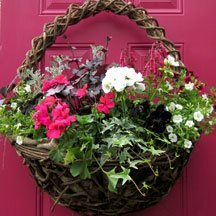 A set of brown containers adjacent the front door with a mirrored planting of bright coleus in multiple complementary colors of purple, bright lime green, and deep rose can really highlight the entry to a plain stone or sided home. Containers can decorate. They can be a convenience to the cook, a practical way to plant a tomato garden on your patio, and even a place to hold a mini-garden. Container gardening is what you want it to be. Let us help you start one this summer!